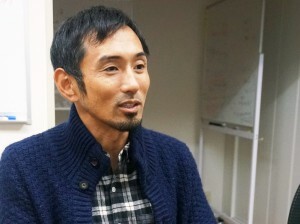 Dai Tamesue became Japan’s first World Championship medalist in a track event when he won bronze in the 400m hurdles in 2001, and then won bronze again in 2005. The “Samurai Hurdler” accomplished another feat by competing in three consecutive Olympic Games—Sydney, Athens and Beijing. He retired in 2012, but his quest did not stop there. Having taken on a variety of activities, Tamesue is venturing into yet another realm: Helping society solve problems—with sports. 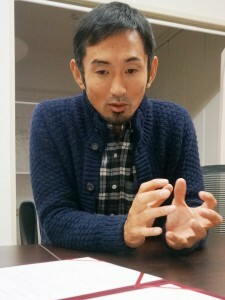 The Foreign Press Center Japan asked Tamesue about topics including what roles sports can play in society and his expectations for the 2020 Tokyo Olympics and Paralympics. The first installment of this two-part article touches on his efforts to send messages to a wider audience as well as his post-retirement activities. The Foreign Press Center Japan (FPCJ, hereafter): You have written about your life as an athlete, which spanned 25 years up until 2012, in your books and social media postings. Could you tell me what motivated you to do this? What is the purpose? Mr. Dai Tamesue: I wanted to be a newspaper reporter when I was a child. I like to learn and spread information. My activities are slightly different from those of media organizations, but I go to Paralympic events to gather information, write about them in my blogs and talk about them on TV. So, I can say that my activities are very close to what the media do. What started all this was an experience I had when I contributed an essay to a magazine. I had never had such an experience in writing before. But the editor had good things to say about my writing, which encouraged me to continue writing. I was one of the first athletes to blog— I started to blog around 2003. When social media emerged around 2010, I felt the ability to describe thoughts in writing would be highly regarded from now on. So I started training myself in writing, which eventually paid off. FPCJ: After retiring, you became one of the founding members of the Athlete Society, which facilitates exchanges among athletes and provides opportunities for them to connect to society. Could you explain your activities at this organization? Until then, I was not much interested in sports other than those in which top athletes compete to win medals. When he told me that, I realized for the first time that sports could be viewed that way. As I further researched, I learned about “sports diplomacy” and “education through sports.” When I retired, I had a vague idea of making a profession out of solving social problems through sports. The Athlete Society initially sponsored study sessions for athletes. But now, it is taking up social issues which can be solved with sports. FPCJ: As part of the organization’s activities, you have become a good-will sports ambassador for Bhutan. Mr. Tamesue: I happened to visit Bhutan, which led me to forge a relationship with the country. I signed a contract with the Bhutan Olympic Committee, under which I visit the country twice a year to teach track and promote Bhutan tourism in Japan. It appears that Bhutan is keen on spreading sports for educational purposes by fostering top-notch athletes. Recently, the country has had illegal drugs smuggled into it from foreign countries. It expects sports to play an educational role, because children are less likely to be led astray deviate if they play sports, as it leaves them only limited time available for other activities. FPCJ: As an executive of R.project, which handles training camp business, you are involved with the utilization of shut-down schools’ facilities in regional communities. Mr. Tamesue: There are various agendas in society, which can’t be handled just by a single person. So, former athletes gathered and started their own ventures, while using my office in Harajuku (Tokyo) as a hub. That was the start. R.project, operated by a former squash player, is pursuing a business model of reusing properties. For example, the company is using the facilities of a closed school by Lake Motosu, near Mt. Fuji in Yamanashi Prefecture, as a training camp site. While there is a shortage of training space in Tokyo, an increasing number of schools in local areas are being closed down due to depopulation. A closed school has its grounds, a gymnasium, and a pool, which makes it an ideal place for training camps. If a school building is used as a lodging facility, you have the ground right in front of you. According to surveys, our customers liked our facilities because of “proximity” (to grounds, gymnasiums and other training sites). About 90 percent of earnings in our training camp business is sports-related. Furthermore, we do unique businesses, for example, by transforming a wholesaler’s building in the wholesale district in Nihonbashi, Tokyo, into a lodging facility for backpackers from abroad. FPCJ: Mr. Tamesue, we understand you are proposing educational facilities, such as primary, middle and high schools and universities, be open to elderly people as a way to solve problems related to the aging society. What roles do you think sports can play in the graying society? Mr. Tamesue: The biggest problem Japan faces is the aging population, and many countries around the world are certain to face a similar problem in the near future. How can we solve this problem through sports? I think it boils down to community-building through sports. For instance, when elderly people come and help children participating in a soccer competition, it will help build a community for them. As a result, they will leave their house, which then helps create an anti-disaster or anti-crime network. I think the use of sports is instrumental in solving problems in the graying society or in regions where a considerable number of elderly people reside. Born in 1978 in Hiroshima Prefecture. He won bronze medals in the 400m hurdles in two World Championships in Athletics—in Edmonton in 2001 and in Helsinki in 2005 winning the first ever world championship medal in a track event for Japan. He participated in three Olympic Games in Sydney, Athens and Beijing. His activities since his 2012 retirement have not been confined to sports, covering wide-ranging areas such as research and development, social and educational issues.